Upstairs, there's a room whose purpose isn't really clear. It's technically a guest bedroom, but it was once a playroom as well. As I've grown up, it's simply become the room in which I watch TV and waste countless hours blogging. I'm writing this from a dorm room, but you better believe it, if I were home, I'd be in that room writing this post. In that room, posters have come and gone, but there are five that have always remained. First, next to the window, on the couch's left (and furthest from the door) there's a picture of Joe Sakic, circa 1996. He's wearing a Stanley Cup patch and in the white home jersey. Moving to the right, there's a poster near the ceiling of (all) 26 NHL teams with the old orange and black NHL logo. Below that, there's one featuring Sakic, Patrick Roy, Peter Forsberg, and...Claude Lemieux. Behind the TV stands a huge shot of Patrick Roy, no doubt guarding the television screen from annoying sisters who think that it's funny to switch the channel during playoff overtime. Finally, next to Roy is Peter Forsberg. A simple shot of him looking up ice with the big, bold "Forsberg" text over his head. If you were an Avs fan at any point in the 90s, these were your heroes. I'm not sure if I understood at the time that these were three of the greatest players to ever live. Certainly I realized it when Roy broke Sawchuk's wins record in 2001. And Sakic, well, he was the captain - infallible. But Forsberg, he was a different animal. For those of us too young, we weren't necessarily fully cognizant of all that he had done. Yeah, we knew he was on a postage stamp in Sweden. But YouTube wasn't around to show us the goal. We didn't realize that he had won an Olympic gold medal in 1994 either. Hell, his 116-point, 82-game regular season in the 1996 Cup year was barely noticed due to a lack of NHL Center Ice and Internet access. At the time, I was too young to realize he had scored a natural hat trick in Game 2 of the Finals against Florida. Yet thanks to The Hockey News and other magazines which I now long for, we knew that he was a special hockey player. Depending on how you looked at it, he was Sakic's sidekick or Sakic was his. Think about this - after that 82-game regular season (his second in the NHL), "Foppa" never again played 82 games in any year. In fact, in his 13 NHL season, Forsberg only played more than 70 games five times. Yet, look at those numbers. Fourth all time in assists per game (.900). Member of the "Triple Gold Club." A points-per-game average in the top-10 in NHL history. Art Ross and Hart Trophy winner in 2002-03, just one year after missing the entire regular season for "spleen recovery." He was Peter the Great. The Puck Wizard. His highlight reels are matched by very few. He hit, passed, and scored with the best of them. A +238 in his career, I don't think anyone could ever call him a burden. I've had the privilege of seeing Forsberg play live numerous times in Philadelphia. My favorite moment? Easy. 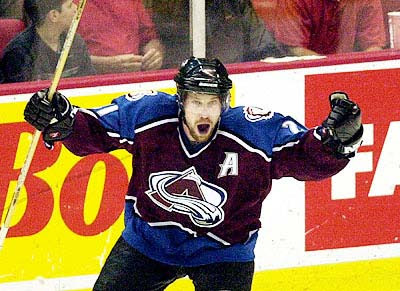 It was the 2002-03 season - Foppa's MVP year - and the Avs and Flyers - were tied at one. Forsberg, having scored the Avalanche's lone goal of the night, started the overtime. The Flyers won the faceoff and the defensemen controlled the puck at the Philadelphia blueline. 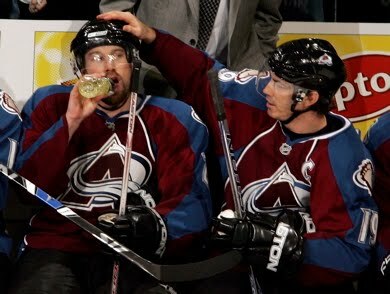 All of a sudden, sneaky as a mouse, Forsberg pick pocketed the Flyers defenseman, broke in alone on goaltender Roman Cechmanek (good grief) and scored 26 seconds into the extra period to give the Avs the win. With the bottom half of the net taken away, the Swedish All-Star lifted a backhander under the crossbar for his 24th goal and Colorado’s fourth win in five games. Another great moment was when Forsberg (in those dark times when he returned to play for the Flyers, the team that drafted him) had the (weird) chance to play against his former team. 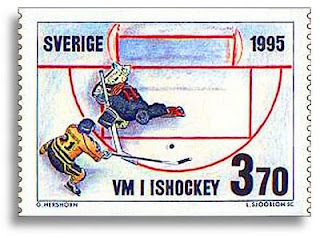 The first faceoff of the night featured Forsberg and Sakic. How weird must that have felt for both players? Forsberg had one (tying) goal and one assist in the final three minutes of play to send the game to overtime. The Avs survived, however, and won thanks to a 5-on-3 goal by Alex Tanguay. 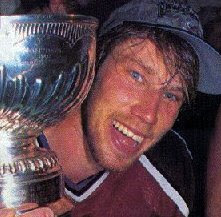 Peter Forsberg was gracious enough to pick up the bill when he dined with a group of his former Colorado teammates. The Avalanche returned the gesture by sticking Philadelphia with a loss. Alex Tanguay scored with 45.8 seconds left in overtime, helping Colorado spoil Forsberg’s first game against his former team in the Avalanche’s 4-3 win over the Philadelphia Flyers on Saturday. In the end, however. Forsberg wasn't a Flyer or a Predator. He was a member of the Colorado Avalanche. The organization was gracious enough to give him one last chance at finishing his career on his terms. It didn't work out. But next season, #21 will hang in the rafters with #s 77, 33, and 19. Thank you Foppa, for allowing me to watch one of the greatest hockey players the game will ever see. You will be missed.